Dr. Christopher P. Godek of The Personal Enhancement Center says CoolSculpting® continues its rise in popularity as one of the most effective non-surgical options for patients looking to reduce excess fat pockets in a variety of body areas. 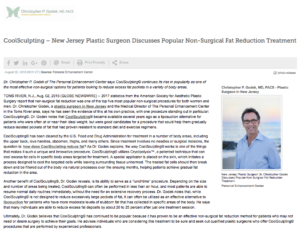 Toms River, NJ – 2017 statistics from the American Society for Aesthetic Plastic Surgery report that non-surgical fat reduction was one of the top five most popular non-surgical procedures for both women and men. Dr. Christopher Godek, a plastic surgeon in New Jersey and the Medical Director of The Personal Enhancement Center in the Toms River area, says he has seen the evidence of this at his own practice, with one procedure standing out in particular:CoolSculpting®. Dr. Godek notes that CoolSculpting® became available several years ago as a liposuction alternative for patients who were often at or near their ideal weight, but were good candidates for a procedure that could help them gradually reduce isolated pockets of fat that had proven resistant to standard diet and exercise regimens. CoolSculpting® has been cleared by the U.S. Food and Drug Administration for treatment in a number of body areas, including the upper back, love handles, abdomen, thighs, and many others. Since treatment involves no needles or surgical incisions, the question is: how does CoolSculpting reduce fat? As Dr. Godek explains, the way CoolSculpting® works is one of the things that makes it such a unique and innovative procedure. CoolSculpting® utilizes Cryolipolysis™, a patented technique that can cool excess fat cells in specific body areas targeted for treatment. A special applicator is placed on the skin, which initiates a process designed to cool the targeted cells while leaving surrounding tissue unharmed. The treated fat cells should then break down and be filtered out of the body via natural processes over the ensuing months, helping patients achieve gradual fat reduction in the area. Another benefit of CoolSculpting®, Dr. Godek reveals, is its ability to serve as a “lunchtime” procedure. Depending on the size and number of areas being treated, CoolSculpting® can often be performed in less than an hour, and most patients are able to resume normal daily routines immediately, without the need for an extensive recovery process. Dr. Godek notes that, while CoolSculpting® is not designed to reduce excessively large pockets of fat, it can often be utilized as an effective alternative to liposuction for patients who have more moderate levels of stubborn fat that has collected in specific areas of the body. He says that many individuals are able to reduce excess fat deposits by about 20 to 25 percent after just one treatment session. Ultimately, Dr. Godek believes that CoolSculpting® has continued to be popular because it has proven to be an effective non-surgical fat reduction method for patients who may not need or desire surgery to achieve their goals. He advises individuals who are considering this treatment to be sure and seek out qualified plastic surgeons who offer CoolSculpting® procedures that are performed by experienced professionals. Dr. Christopher Godek is a board-certified plastic surgeon and a member of the American Society of Plastic Surgeons, the American Society for Aesthetic Plastic Surgery, and the American Medical Association. He is also a Fellow of the American College of Surgeons and a past president of the New Jersey Society of Plastic Surgeons. At the Personal Enhancement Center, Dr. Godek oversees a comprehensive cosmetic enhancement program consisting of both surgical and non-surgical treatment options. In addition to CoolSculpting®, procedures available at the practice include breast, body, and facial rejuvenation treatments such as breast augmentation, liposuction, BOTOX® Cosmetic, laser skin resurfacing, tummy tuck surgery, and many others. Dr. Godek has been recognized as one of Castle Connolly’s Top Doctors and has been listed in the Guide to America’s Top Physicians. Dr. Godek is available for interview upon request. For more information about The Personal Enhancement Center, visit personalenhancementcenter.com and facebook.com/personalenhancementcenter.